Operating income more than halved after specific items and SBC for Ceva Logistics during the first six months of what the company described as a “transformative period”. Between January and June, Ceva listed on the Six Swiss Exchange, generating proceeds of $820m, and shipping line CMA CGM taking a 24.99% stake for $378m. “We have used a substantial part of the proceeds from the IPO and the concurrent private placement to CMA CGM in May to repay debt,” said the operator. First-half revenue increased 9.7%, year on year, to $3.6bn, leading to an 14% growth in ebitda of $119m. However, its $52m of operating income was reduced to $15m after costs. Yet the company seemed buoyed by the positive revenue and the success of its IPO, and chief executive Xavier Urbain said the benefits of the listing were already becoming apparent, especially in regard to its reduced debt. “Ceva continues to perform well. We now have achieved seven consecutive quarters of strong top-line growth and stronger ebitda,” said Mr Urbain. He added that the company was also engaged in a “number of promising discussions” and making progress in its partnership with CMA CGM. The shipping line this month received regulatory approval for its investment in Ceva and expects CMA CGM securities to be converted into registered shares by 13 August. “We’ve worked closely together to exploit the partnership in a number of areas, particularly integrated end-to-end solutions and expanding geographic coverage,” the company said. “The first contracts have been concluded, where Ceva was introduced to clients from CMA CGM, and further discussions are ongoing. The deal came during a period of good business momentum, the company said, with new business wins up some 10% on 2017. Seeking to take advantage of a strong market, Mr Urbain said first-half efforts had been geared towards reducing costs, addressing underperforming activities and improving productivity. In terms of divisional breakdown, its freight management division saw an 8.1% upturn in second-quarter revenues, while ocean volumes grew at a rate of 8.3%. And while air volumes were “softer” than in the first quarter, the company put this down to the loss of certain customers. “However, the implementation of important new contracts which were won during the spring tender season will drive [air] volume growth going forward,” it stated. 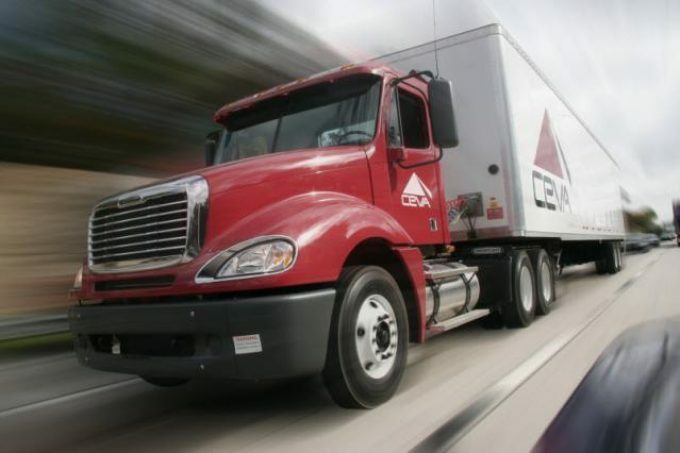 Ceva said profits would have been higher had they not been “adversely” impacted by increased costs in its US ground business linked to driver shortages. And this problem has not dissipated, but Ceva believes its mitigating actions will reduce the expected impact over the final two quarters of the year. “Ceva is expecting good growth and continued margin progression in the second half of 2018, and we’re confident of meeting expectations, subject to no market changes,” it said.